One of the first patients I ever treated as a newly-minted physio was a lovely old bloke with a decidedly unlovely ankle sprain. The ankle, courtesy of a slip on wet cement, was gothic horror movie purple, blue and black and about four times the size of its uninjured companion. The injury itself was only minor – what we refer to as a Grade 1 sprain (minor tissue damage to the ligament but no change in its length or function when stressed) – but its little shop of horrors appearance was due to the patient being on blood thinners for a heart condition. 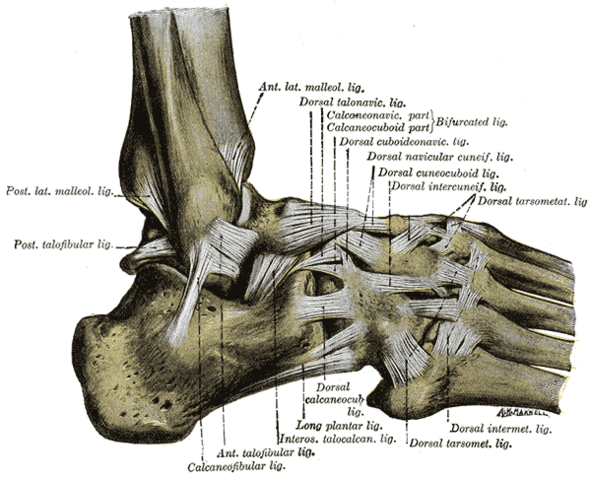 The most common ankle sprain is the plantar flexion-inversion sprain aka rolling over on the outside of the ankle. As per my patient this typically occurs on unstable or uneven surfaces or with landing or jumping onto an awkwardly positioned foot. 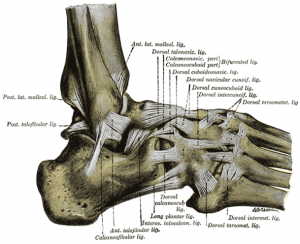 The sprain is either a Grade 1 (as above); a moderate Grade 2 – damage of more fibres with a concomitant increase in ligament stretch or laxity; or Grade 3, a complete rupture. The bad news – if you’ve had one you’re at greater risk for having another. The good news – work on your balance, reaction timing and proprioception and you’re well on the way to avoiding a repeat performance. Good management starts immediately at the time of injury with the ever reliable rest (R), ice (I), compression (C), and elevation (E). Get this part right and your recovery time can be dramatically reduced. Physiotherapy treatment to reduce inflammation and manage pain starts early on and as recovery progresses the physiotherapist works with the patient to restore muscle length, restore tendon and muscle strength and regain joint range of motion. We then work to address factors contributing to the original injury including poor foot and lower limb biomechanics, restricted neural tissue, balance and proprioception, and cardiovascular fitness. The last, and often overlooked, component of rehab is sport, work or lifestyle-specific retraining. If your job has you walking on uneven ground, you live in a high-set house and run up and down stairs all day long, or you play in the NRL and need to regain full explosive agility – whichever it might be, we work with you to return you to your full pre-injury level of function.